Quick Indian Pizza Recipes, 40 Vegetarian Pizza Recipes. Everybody loves pizza, but it is so time-consuming to make at home that we usually end up having it from a pizzeria. If we gave you pizza recipes, which can be made quite easily and quickly, wouldn’t you be excited to make it yourself? Use your left over dosa batter to make Uttapam Pizza. Yes, Indians love their pans in the kitchen and lots don't have ovens at home. So go and try Pizza in a Pan and use pre made pizza sauce. We innvative the Khichu and got you Pizza Khichu. Use your craker biscuits to make Pizza Crackers. Try our Pizza Paratha recipes. Use paneer to make Tandoori Paneer Pizza. We have used Khakhra as a base to make Khakhra Pizza which is way healthier than a maida based pizza. Use Oats, the super food to make Oats Bhakri Pizza. Make a super healthy Bhakri Pizza from a base of bajra and jowar. We have this very often in our house as the kids also love it and its very tasty and gluten free. 1. Prepare a batch of pizza sauce, and store it in the deep freezer. 2. Keep thin crust pizza base in your fridge. 3. Always have stock of processed cheese. 4. Stock bread to make Bread Pizza. 5. Have Khakhra and convert to Khakhra Pizza. Whenever you crave for quick veg pizza, or have an unexpected guest, pull out the pizza sauce, pick one of these recipes, and whip up a delicious treat like the quick tomato pizzas, tomato and cheese pizza, or spinach pizzas. Tasty and quick, pizzas can’t get better than these! Pizza Margherita can be made quickly for kids A soft crust topped with a zesty pizza sauce and smothered with a generous layer of cheese, this basil flavoured pizza is sure to impress you with its simple elegance. Use your microwave to make Quick Microwave Mug Pizza and great treat for your kids when they come home from school. Use bread as the baseand bake it to make Bread Pizza. 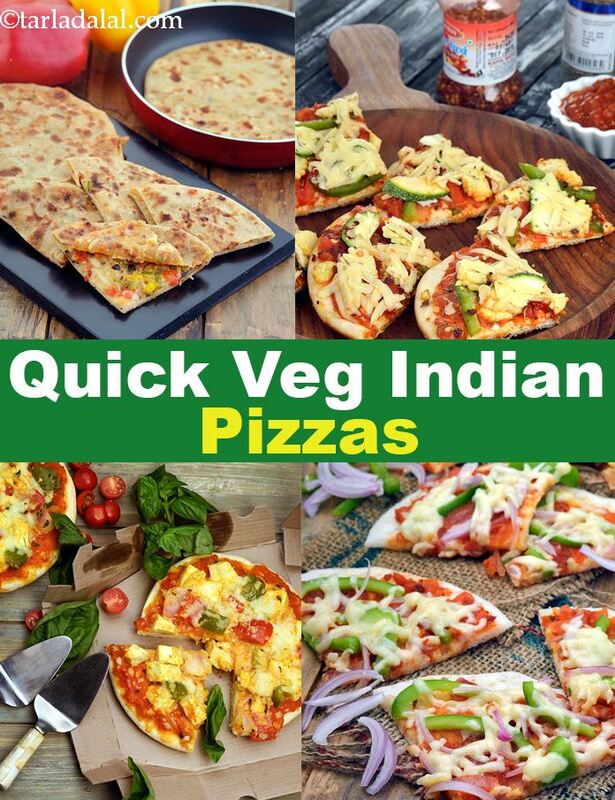 Enjoy our Quick Indian Pizza Recipes, 40 Vegetarian Pizza Recipes and other quick recipe articles below. Cheese and corn is a made-for-each-other combination. Add to this aromatic pesto with crunchy walnuts and you have an unbeatable topping for your pizza. Choosing mini pizza bases makes the Cheesy Corn and Pesto Mini Pizza a perfect choice for parties. Iron-rich jowar and bajra flours replace maida in these healthy pizza bases, which are then topped with a traditional tomato-based sauce. Let your kids help to assemble the bhakri pizzas to add to their enjoyment. This dish can be served as a delicious evening snack and its eye catching looks make it more suitable for serving to guests. Pizzas with paneer is a wonderful combination so make sure you try it. A health inspired pizza recipe, delicious bread pizza has toasted whole wheat bread as the pizza base and the vegetables cooked in a delectable pizza sauce as topping. A tasty and healthy alternative to a typical junk food ,pizza. If there is no tomato puree u can add tomato ketchup. Bread pizza ready to eat without oven.